Coach Dion: JUST HOW LONG IS A MARATHON? No, running a marathon is never that easy, you need to register, no problem I picked up my number from the New Balance shop in Diep River. From there I drove through to Simon's Town, and the end of the race. Peninsula marathon is a point to point run and Yes I had talked my lovely wife into getting up at 03h50 to take us to the start, but there is no way she was going to drive in the race traffic to fetch us... She is more amazing then that she was going drop the car off and join us on her bike. OK so having dropped my car off I hopped on my bike and cycled the 25km home... With Cape Town's famous Cape Doctor making house calls I was blown home in no time at all! The wind she is blowing! The wind blowing me home was good, but we needed the wind the drop over night or it was going to be a long hard day on the road. The 05h15 start was cool and the wind was still asleep, so with the crack of the gun we set of down the road, I took about half a km to catch Stef and the 2 of us set about getting to Simon's Town before 08h15. It took us 3km to get the pace right, but the 30 sec in the bag wouldn't cause it to break! 5km - 10km 20:13 slight climb and a bit of wind, but we were still moving well. 10km - 15km 20:08 a bit down and a little climb, no more wind Stef starting to warm up, and Dawn meets us on the side of the road. We hit half way in 1h24:24 4:00 on the button!!! 30km - 35km 20:44 Stef backs off at 32km at I drop the group who are caught off guard, I was setting the pace into the wind with Stef behind me and then 2 or 3 other guys along for the ride... Stef slowed to 4:30's and I kept going. 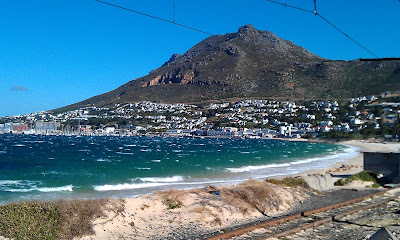 After the little climb out of Fishhoek I hit the wind again, it's not bad, but enough to slow me a little.. So now the question is do I run Oceans, there is only one 2Oceans, it's not a half or a trail run, is 56km! Yes I'm running the trail race on the Friday, the day before, but what is 2 hours on the mountain? As i finished, or even in those last couple of km I was thinking not a chance, but... I did jog down to the car to fetch a top and it was easy, so maybe, I've got a couple of days. Absolutely you have to do 2 Oceans. After all there is only one. And the trail race is just a little warm up for endurance junkies like you. You thrive on pain don't you?! Agree with Char. One thing is sure, you'll never know till you've given it a go. You're young enough and I reckon you're strong enough. Just set your mind to it - and go. Sounds as if you have really already made up your mind to do it, just looking for confirmation that you should run it. If it won't hurt you, do it, sounds beautiful!